This year again, Dior has launched a very classic collection for the holidays, called Golden Shock (see my review of one of the two LE palettes). 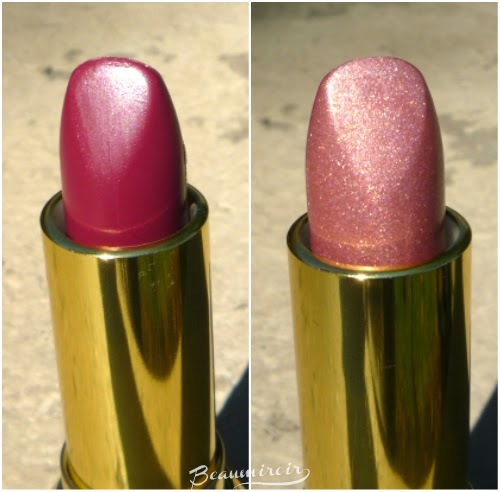 Diorific Golden Shock Colour Lip Duo is probably the most original item in the collection, and a type of product I had never seen by a high-end brand: a two-faced lipstick that has 2 shades in one stick (dang, how do you call that part, the lipstick itself? It's called the "raisin" in French but I doubt the literal translation works in English, does it?). The only similar product I know is a drugstore staple, NYC City Duet, and I was pretty excited about a luxe version of the concept. 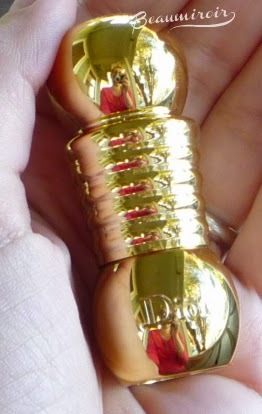 The packaging is luxurious indeed, it's your typical Diorific heavy, golden tube. I find that it doesn't show fingerprints too bad for a metallic tube. 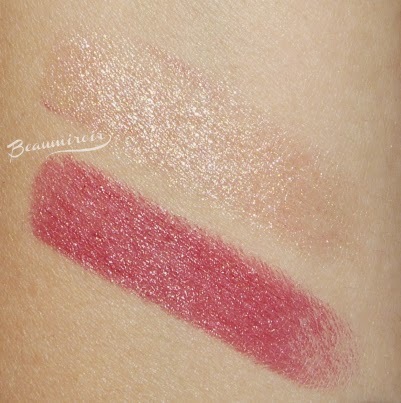 I bought shade 005 called Daring Shock, a beautiful, creamy plumy rose paired with a shimmery champagne pink. 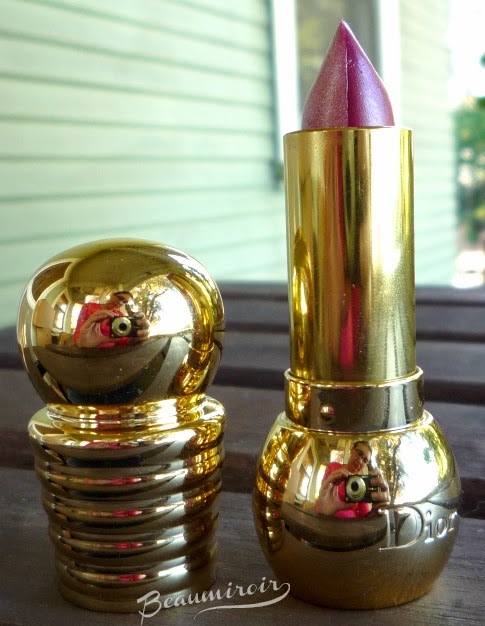 The lipstick has Dior makeup's signature powdery floral scent, light and pleasant. The Diorific Golden Colour rouges are described by Dior as having a matte side and a metallic side, and I can't agree with that description. The color half is definitely NOT matte, it's a satin with a bit of sheen, as you can see on the pics. The sparkly half is also absolutely not metallic, it's a very sheer wash of shimmer with a very faint beige tint when applied. The rose side has rich pigmentation and a thin, light-weight texture that covers lips easily, but with the shape of the lipstick, it's really hard to apply well: the sharp edge of the stick, which usually allows precise application, being where the 2 colors meet, it's almost impossible not to mix the colors accidentally, especially when the sticks starts to get more rounded after a few uses. You absolutely need to apply with a brush for more control. 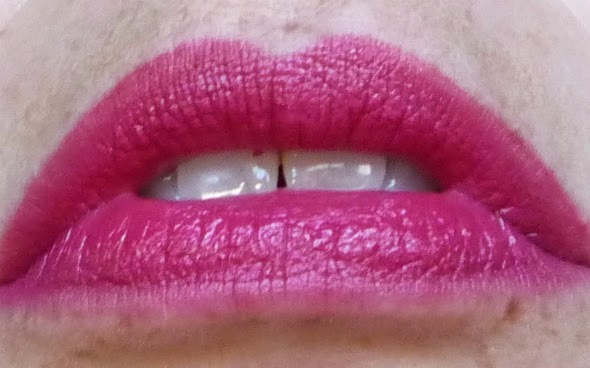 Additionally, something in the texture doesn't work well on lip contour. Even when being super careful with my lip brush, I don't have a perfectly clean lip line. That makes a lip liner mandatory for a perfect look. The wear time is good, but it does transfer a lot. A classic makeup tip is to add a bit of shimmer to the center of your lips to give the illusion of fuller, plump lips. That's what I tried with Daring Shock, applying the plummy rose as a base and then the shimmery side around the center. The result is very, very... subtle. There's a bit of visible sparkles that reflect the light a little more, but I don't think that anybody could tell which pictures are with or without the added shimmer without me saying it. It's just barely visible. 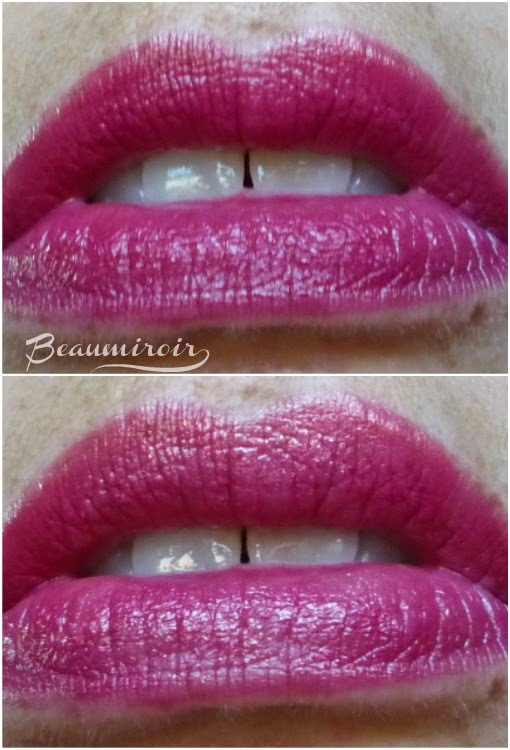 With the shimmer side of the lipstick being so sheer and weakly pigmented, you simply can't do bolder looks like an ombre lip - something I was hoping to do with it. 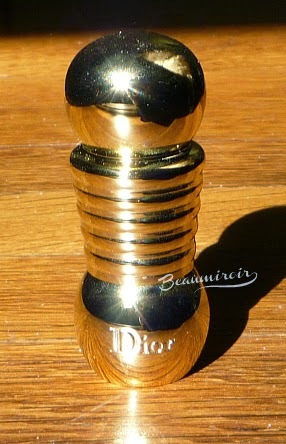 Not quite the "opulent" metallic shade that Dior is promising. Overall: that's a fail for me. 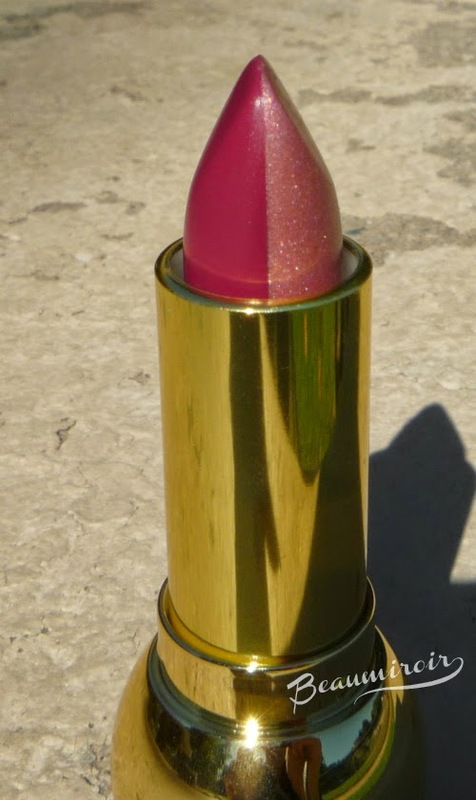 The idea of a 2-in-1 lipstick with a cream and a shimmer was great, but the end product here is really disappointing. It's a pain to apply (lip liner + brush absolutely necessary) and with a barely there shimmer side, the effect is just meh. Considering this product is around $38, I don't think it's worth it. Save a few dollars and buy a regular Dior Rouge! Where to buy: nordstrom.com , macys.com , sephora.com and your usual retailers.